How to Live Through a Bathroom Renovation like a Pro! How to Live Through a Bathroom Renovation like a Pro! How to Live Through a Bathroom Renovation like a Pro! A bathroom renovation is on nearly every homeowner’s to-do wish list. Who doesn’t dream of a serene, spa-like bathroom where you can relax and unwind after a long day? A beautifully updated space can also increase your home’s value in Halifax’s local housing market. Whether you’re considering a full remodeled space or just a few updates, we’ve listed 5 tips below to help you handle your renovation like a pro. How many people are getting ready at the same time in the morning? Would 2 sinks make things run more smoothly? Is the overhead light ok or would you like a well-lit space incorporating layers of task and accent lighting? Consider your current bathroom and the things you like and dislike about the space – this list will help guide your decisions. Now is the time to think about how it will fit into your lifestyle and help make your mornings flow more easily. There can be a lot of choices when it comes to remodeling a bathroom. Gathering ideas and finding your design style is a good place to start. Look through magazines and find images that inspire you. Websites like Houzz and Pinterest are perfect for helping you gather and save ideas online. The photos will help you, the designer, or contractor better understand what you’re looking for. Once you have your ideas together and your needs figured out – the next step is to plan the project. The more planning you do upfront, the easier and more smoothly the project will go in the end. The size of your bathroom, the quality of materials you want to include and whether you’re planning to do some of the labor yourself all can affect the cost of a remodel. Before you buy anything, you’ll need to determine a full budget and timeline for the job. Are you reconfiguring the space and moving plumbing? Do you have exact measurements for supply orders? A typical countertop is 32 to 34 inches off the floor – how will an above-counter sink vessel affect the install height? How long will it take for your products to be delivered? This is the time to take a realistic look at what you can expect for the budget you’ve put aside. Your wish list may need to be scaled back at this point, but it’s better to know now than when you’re mid project! Even in a small space, if you’re changing the layout, you’ll need sketches and floor plans. These drawings will ensure everything fits together flawlessly and there’s enough space for your fixtures. You need the layout and functionality to come together to work for YOU! The images you’ve selected and the budget you’ve created will help guide you to the materials you’d like to see in the finished space. This is where you consider how the flooring, vanities and counter tops, etc. will all work together. If you’re not using an experienced designer to help with your selections, you’ll need to consider insider tips like: non-slip flooring, using dark grout to show less wear and tear, easy to pull handles and faucets for children’s or aging hands, etc. Because bathrooms are smaller spaces to renovate, splurging on a few higher-end materials and finishes can be a good investment. A few well thought out items can make your space seem incredibly luxurious. If you’re renovating the entire space, you’ll need to think of a backup plan for your regular morning routine. Will your whole family need to share one space? Will you need to rent temporary facilities for your home or stay with friends? Missing plug covers, paint touch ups, a broken tile – can all be taken care of once the main work has been completed. It’s good to take notes or photos as a reminder towards the end of the project. Remember that all jobs are unique and will have a few wrinkles along the way. During the unavoidable inconvenience of construction, try to remember the big picture. Keep the process in perspective and remind yourself of the end goal – short term pain for long term gain. Renovations can be challenging to live through, but being prepared can help. The more you know, the more comfortable you will feel. 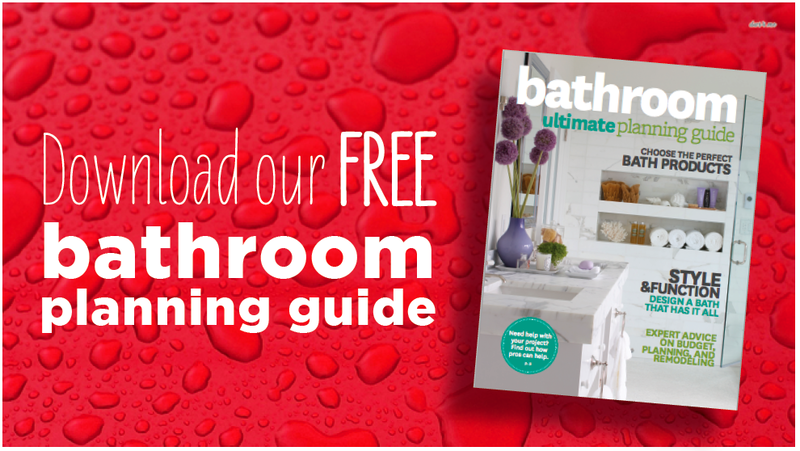 You can download a free bathroom planning guide here. It’s full of expert advice on budgeting, planning and remodeling insights to help transform your space from functional to fantastic.